Women also use it as a tool to help them prepare for childbirth. 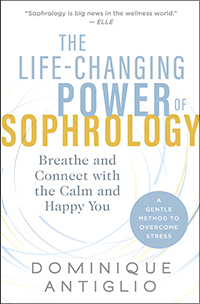 The Life-Changing Power of Sophrology: Breathe and Connect with the Calm and Happy You by Dominique Antiglio opens up the world of Sophrology to a global audience and equips readers to cope with the ups and downs of life through flexible and effective methods, in just minutes a day. We hope you’ll enjoy this excerpt from the book. I talk often of the “gentle superpower” of Sophrology, but its purpose is not to create “superwomen” or “supermen” of us but rather to support individuals in knowing themselves, their strengths, their values, and, very importantly, their limits. When I guide my one-to-one and group Sophrology sessions, I see people from all different situations in life and with diverse experiences, backgrounds, and emotions. They come to me with a huge variety of issues — from anxiety to sleep problems, lack of confidence, or simply to prepare for an important event. What they all have in common is that they can no longer carry on in the way that they have been. They need something to change — for their happiness, for their health, for their career, or for their reason to get up in the morning. Often for all of these. I’m not a big fan of statistics, but I think we should all be talking about the research that tells us that stress, and particularly chronic stress, is a factor in five out of the six leading causes of death — heart disease, respiratory disease, strokes, cancer, and fatal accidents. It is estimated that between 75 and 90 percent of visits to the doctor are stress-related. Having too much going on is now seen as a good thing — juggling priorities, rampant social media, and an endless list of things to achieve are viewed as a badge of honor. When do we ever stop and pause? When do we put ourselves first? In our demanding world, filled with its overwhelming load, noise, and stimulation, we have lost the connection between what we feel inside and what we see and experience outside. We have lost the ability to just be in the moment and listen to our deepest self. Those who cope best with the stresses of modern life and find the greatest sense of happiness are the ones who can deal positively with these pressures, naturally or through personal self-help or some sort of discipline (such as sport, meditation, or good nutrition). Perhaps they have a passion or hobby, a positive community around them (family, friends, partners), or strong values and a sense of purpose, knowing who they are. But, even with the best intentions and support, everybody can struggle at some point in their life and feel that something needs to change. Sophrology offers the chance for you to pause, to connect with and clear stress today, and to channel your resources for a better tomorrow, true to your own self. It supports you to consciously and positively deal with difficulties and tensions, to find your place on this planet, and to create meaningful encounters with others. Many people I meet as a Sophrologist feel that they’ve already “failed” at other forms of self-help because they couldn’t “do” them or didn’t find the time or space in their life. I welcome them to Sophrology with the news that they are not required to do or be anything for the power of Sophrology to “reset” their lives — they just need to start with giving themselves 10 minutes a day or 20 minutes three times a week to be guided in the practice. Sophrology differs from other therapies in ways that make it so much more adaptable and easy to fit into our busy lives and to reflect who we are as people. There is no need to get changed or carry your yoga mat around — you can start your Sophrology practice in your office, at home, or even as you commute. And you don’t need to be able to stand on your head to be able to benefit from Sophrology, or even to stand or sit still for any length of time at all — it adapts for all physicalities and abilities. Through my own interest in exploring what helps people to help themselves, what struck me straightaway with Sophrology was that it required nothing from me, and that its powerful effects were immediate. As a teenager coming to Sophrology, I didn’t have the time or inclination to spend hours learning new practices or ingesting information about how the body worked, and I didn’t want to engage in something that meant I needed to talk about myself for hours. Already, I think I was looking for some way to be in control of myself — doing something to support my own body to look after itself rather than asking someone else to use their knowledge on me. Through all my training and personal development I have become more and more aware that we are complex beings, and that our body, mind, soul, behaviors, beliefs, upbringing, relationships, and lifestyle are all connected, and all influence us. On my quest to gain a holistic understanding of our complexity as a human being and how to best engage in it as a therapist, I further trained and experimented with many approaches. My personal and professional journey has crossed the paths of acupuncture, homeopathy, Ayurveda, nutrition, reflexology, essential oils, yoga, Pilates, meditation, psychology, family constellation therapy, geobiology, and sound therapy. I further trained in biogenealogy to understand how personal limiting beliefs and behaviors, often shaped by our upbringing and the life experience and dynamics of our family members and ancestors, can be understood and improved, or positively transformed. The simplicity of Sophrology, coupled with its deeply transforming power and adaptability, though, has always affected me most deeply. It doesn’t ask us to believe in anything (it is more about learning to switch off our brain) or conform to any group, and it is a practice that encourages freedom, responsibility, and nonjudgment. Its clear guided exercises allow you to start practicing and feeling the effects straightaway. It is adaptable to all styles of living, all levels of health, and all schedules — you can complete the exercises at home or on public transit (or even hidden in the loo before an important meeting!). It’s an easy way into meditation-type techniques. In a busy life, a lot of people find it hard to sit still and meditate. Sophrology’s simple step-by-step approach adapts to different needs and abilities so that everyone can access a meditative state and enjoy the many other benefits of this dynamic practice. Its practice will support you to overcome stress and help you find calm, positivity, and greater awareness in your daily life. It teaches you to live more in the present moment, but it also helps you to transform your relationship with your future and your past. It doesn’t ask you to unburden yourself of past issues, relationship problems, or difficult histories — you can find your inner peace without analysis or deep examination. It complements other physical and psychological therapies, such as osteopathy, yoga, or psychotherapy, and allows you to accelerate your progress and deepen your experience. There is no spiritual connection or association necessary for Sophrology — it is purely your own journey; you are not asked to work on any spiritual practice. And, finally, it teaches you a set of exercises and practices that you can use at any time and in any place to help you deal with what life throws at you. YOU become your own “on the go” healer, with a personal supertool kit. And you regain the power to be in control of your own life. Most significantly of all, Sophrology comes from within ourselves. Sophrology is unique in the way it works directly with our personal superpower — our consciousness. Our consciousness is the energy within us, a vital power that organizes and keeps our mind, body, and soul in connection so we can function and live our existence. It’s also what allows us to make choices in the way we respond to emotions, situations, people, and events, and is the key to our inner resources of confidence, resilience, positivity, and serenity. The author of The Life-Changing Power of Sophrology, Dominique Antiglio gained her master’s in Caycedian Sophrology in 2006, notably training with Professor Alfonso Caycedo, the founder of the method. In 2011, having witnessed many positive changes through the power of Sophrology for herself and her clients, she moved to London and founded BeSophro, a leading Sophrology clinic. Through BeSophro she supports and inspires a wide variety of clients, individually and in groups. Her work has been featured in the Guardian, the Telegraph, and Psychologies. Find out more at https://be-sophro.com/. Excerpted from the book The Life-Changing Power of Sophrology. Copyright © 2018 by Dominique Antiglio.